There are multiple factors contributing to the development of this problem. Damage to the nerves, ligaments, and/or tendons of the foot can cause subluxation (partial dislocation) of the subtalar or talonavicular joints. Bone fracture is a possible cause. The resulting joint deformity from any of these problems can lead to adult-acquired flatfoot deformity. Dysfunction of the posterior tibial tendon has always been linked with adult-acquired flatfoot deformity (AAFD). The loss of active and passive pull of the tendon alters the normal biomechanics of the foot and ankle. The reasons for this can be many and varied as well. Diabetes, high blood pressure, and prolonged use of steroids are some of the more common causes of adult-acquired flatfoot deformity (AAFD) brought on by impairment of the posterior tibialis tendon. Overstretching or rupture of the tendon results in tendon and muscle imbalance in the foot leading to adult-acquired flatfoot deformity (AAFD). Rheumatoid arthritis is one of the more common causes. About half of all adults with this type of arthritis will develop adult flatfoot deformity over time. In such cases, the condition is gradual and progressive. Obesity has been linked with this condition. Loss of blood supply for any reason in the area of the posterior tibialis tendon is another factor. Other possible causes include bone fracture or dislocation, a torn or stretched tendon, or a neurologic condition causing weakness. The symptoms of PTTD may include pain, swelling, a flattening of the arch, and inward rolling of the ankle. As the condition progresses, the symptoms will change. For example, later, as the arch begins to flatten, there may still be pain on the inside of the foot and ankle. But at this point, the foot and toes begin to turn outward and the ankle rolls inward. As PTTD becomes more advanced, the arch flattens even more and the pain often shifts to the outside of the foot, below the ankle. The tendon has deteriorated considerably and arthritis often develops in the foot. In more severe cases, arthritis may also develop in the ankle. 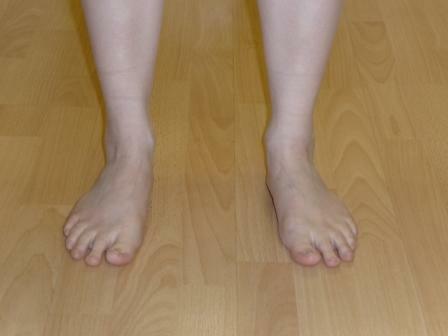 Symptoms, which may occur in some persons with flexible flatfoot, include. Pain in the heel, arch, ankle, or along the outside of the foot. ?Turned-in? ankle. Pain associated with a shin splint. General weakness / fatigue in the foot or leg.